I absolutely fell in love with Reykjavik (and Iceland at large). My first 15 minutes in Reykjavik involved walking from the bus terminal to the city center – I remember laughing at the fact that there wasn’t a single person out on the street despite it being a public holiday! But that’s the beauty of this city. It’s the capital of Iceland, is home to two-thirds of the country’s population, and yet it is like no other capital city. 24 hours in Reykjavik passed by too soon. The city is quiet and cozy, there aren’t too many global food or coffee chains, and yet there’s an unparalleled energy to it – it’s almost magical. Iceland ranks the second happiest country in the world, and I can see why. They have such a simple approach to life, are fiercely proud of their history and heritage, and are surrounded by abundant natural beauty! Take the Flybus shuttle from the airport to the city. It costs 2500 ISK (~USD 25) one way to drop you to the BSI Bus Terminal in Reykjavik, and 3000 ISK (~USD 30) to drop you off to your hostel or hotel (only if it features on their list of drop-off points). You can book your ticket online, or buy it at the airport. You are guaranteed a spot no matter what, and buses leave 45-60 minutes after every flight arrival. This is the cheapest and most convenient way to get to the city. Sandholt Bakery: one of the best bakeries in Reykjavik (albeit a little expensive, like everything else in the city). They have great pastries and breads, coffee, and granola. Kaffitar: one of the city’s famous coffee chains. Their location on Bankastraeti opens early, and they have good coffee and breakfast sandwiches. After breakfast, spend some time strolling around the city aimlessly. It’s such a tiny town you will probably land up where you started off pretty soon. Walk along the streets of Laugavegur and Skolavordustigur for some souvenir shopping (pricey, like everything else in Iceland). If you’re looking for something more offbeat and handcrafted, check out Foa (quite pricey but better than the typical souvenirs you will see in most stores). Take a stroll along the harbor and check out the Sun Voyager monument, a sculpture of a Viking boat. The harbor was the most beautiful part of Reykjavik in my opinion. Consider renting some bikes and cycling alongside some spectacular views! Check out the Harpa concert hall along the harbor, opened in 2011. You can’t miss its colorful eclectic glass exterior, built to provide an illusion of the Northern Lights. The sun’s rays reflect off the glassy façade in a way that mimics the Northern Lights. Unfortunately, the sun doesn’t set in the summer so we couldn’t quite enjoy this illusion! The glass facade of Harpa is just spectacular! Coocoo’s nest: Great place for salads, soups, sandwiches and tacos. It’s a very cute spot that serves excellent hot chocolate. One of my favorite things to do in any European city is take a free walking tour the day I land. It’s a great way to get your bearings, get a good overview of the city and learn some fun trivia by a local guide. The tour I did by CityWalk might have been one of the best walking tours I’ve ever done. I admit I barely knew anything about Iceland’s history before this tour. It was such a great introduction to the city and the country. 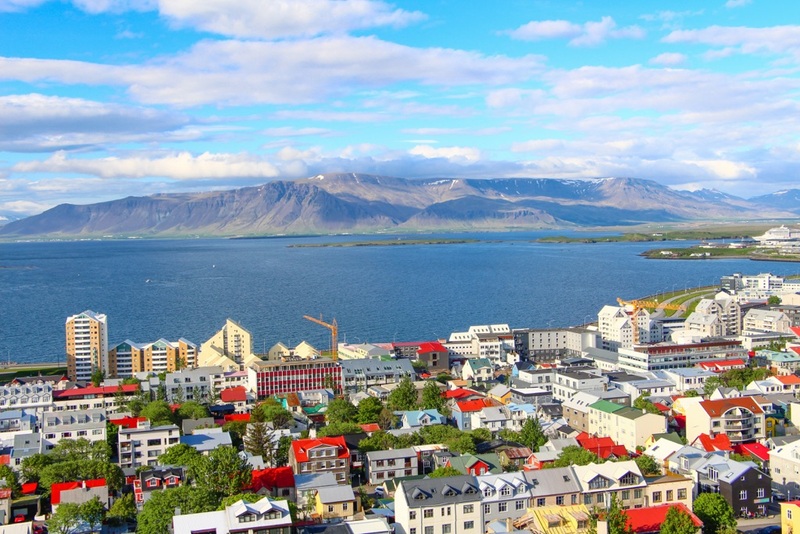 Absolute must-do if you’ve only got 24 hours in Reykjavik! Braud and Co: a great bakery we spotted on our walk! One of the most famous buildings in Iceland, this church was completed in 1986 and can be seen from anywhere in Reykjavik. Entering the church is free, but for USD 10, you can take the elevator up to the observation deck to check out gorgeous panoramic views of the city. What a gorgeous and colorful view from the top of the church! Fun fact: 70% of Icelanders are atheist or pagan! Reykjavik is teeming with great coffeeshops. Almost every street will have at least one. If you have more time (especially if you’re visiting in the summer when the sun never sets), spend some time exploring Reykjavik’s hip café culture. Stofan Café: Super comfy and intimate coffeeshop set across two levels. It almost feels like a cottage in the woods with its poofy armchairs and wooden flooring. They serve hearty meals in addition to coffee. Cafe Babalu is a relatively inexpensive and comfortable spot! Ranked one of the best pizzerias in the city, we had dinner at Hverfisgata 12. Good pizzas and drinks! For drinks, you can head to Kex Hostel (one of the hippest hostel bars in the city) or Micro Bar (the best micro-beer in town). For more suggestions on happy hours and bars, check out this link. What’s the best way to go and see Selfoss Waterfall if I’m staying in Reykjavik? It’s a 45 minute drive from Reykjavik – I would recommend renting a car. If you don’t want to do that, then perhaps look for a guided bus tour that covers Selfoss – most will likely not do only Selfoss, it will probably be a day trip covering other things. There are tons of great tour companies in Iceland – I would recommend googling “day trips to Selfoss from Reykjavik”. Hope this is helpful!